Mother Nature certainly provided us with an excellent display of different types of weather this week (warm sunshine, rain, fog, rain.) It was certainly appropriate that our curriculum for the week was about weather! While we do check the weather every day, it was fun to spend more time talking about different types of weather. Having pajama days this week made it even more fun! We started the week by making a list of weather words and a math graph of our favorite weather (sunny weather won by a landslide!) We were so happy to have Priscilla (Rebecca and Elizabeth’s mom) as our Mom on Monday. 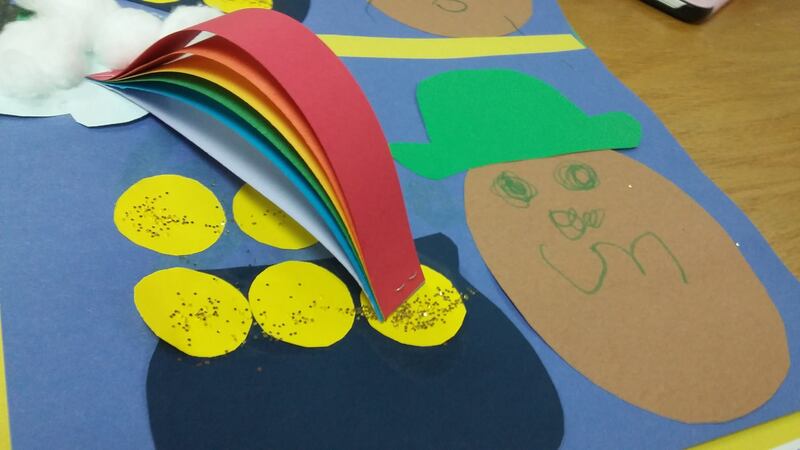 She helped us with our center-based activities by helping the children tear colored paper to make a rainbow. The other centers were making a weather wheel craft and playing a counting game with the letters of the children’s names. The children learned a rainbow song and are practicing the signs for it. Tuesday was our Letter-of-the-Week day. Our story was “What Makes a Rainbow” by Betty Schwartz. The children came up with a list of 31 words that start with R (of course, Rebecca was first on the list!) We put rainbows on R. Tuesday was also our science day and we made a rainbow in a pie pan using milk and food coloring. Then we made the colors “run away” using dish soap on a q-tip. Wednesday’s weather was full of sunshine and outdoor play. Miss Rebecca was unable to come read stories so we were able to spend a little more time outside. Our craft project went with the book “It looked Like Spilt Milk” by Charles G. Shaw. The children made pictures with paint blots and we helped them document what they thought it looked like. Thursday brought shenanigans and fun! 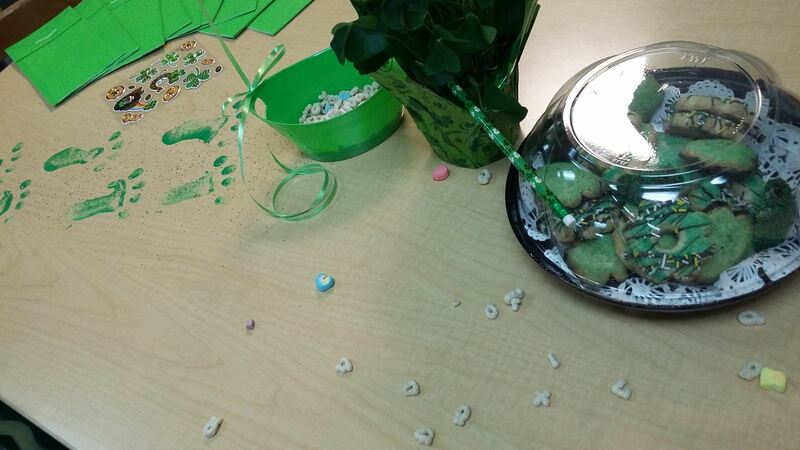 The children arrived to find that Fiona, the preschool leprechaun, had created some mischief in the classroom! Fiona left overturned furniture and green footprints everywhere! She also left objects for the children to find in a scavenger hunt. We talked about St. Patrick and how he was brought to Ireland as a slave, escaped back to England, then returned to Ireland to teach people how to be nice to each other. We used the globe to learn about where Ireland is. We also made a list of things that are green. Thursday was our cooking day. The children helped make the batter for our rainbow waffles. They also had rainbow fruit salad. For craft time the children were split into two groups with some of the children doing marble painting shamrocks and some playing a raindrop/counting memory game. The kindergarten readiness friends used different objects to make their names and also worked on finishing a previously started craft.